Home » Youth Opportunities Unlimited: Supporting Youth to Thrive in Our Community! Youth Opportunities Unlimited: Supporting Youth to Thrive in Our Community! Growing up and navigating the world can be a daunting task if you don’t have support along the way. For many young people, the school system can provide not only knowledge, but skills to help them transition from childhood to adulthood. For some, the traditional school system doesn’t provide the flexibility and support they need to be successful, and they often get labeled as disobedient or unmotivated, falling through the cracks. Sometimes, all these young people need, is a supportive person to listen to them. Someone to understand their specific needs and help guide them along the way; no matter how long it may take, or how many obstacles are in their path. In many communities there are champion organizations that are willing to work with young people in the way that they want, and with successful outcomes. They look to build skills, confidence, and support young people who may not follow a traditional path to be successful in their community. One such organization, Youth Opportunities Unlimited, is located in London, Ontario. Over the next few months, we will explore the different programs and services they offer to support youth to thrive in their community. Youth Opportunities Unlimited (YOU) is a youth serving organization that supports young people in London and Middlesex County to build skills, confidence and thrive in their community. Through their wrap around approach, youth aged 15-29, can receive supports around employment, education, training, health, housing and basic needs. YOU believes that no matter what barriers a youth may be facing they can be successful in the community; all they need is a little bit of help. For over 30 years YOU has been providing youth with not only one on one case management and group workshops, but also with hands on training through their Social Enterprises. The first program at YOU we will explore is Training for Employment Success (TESS). 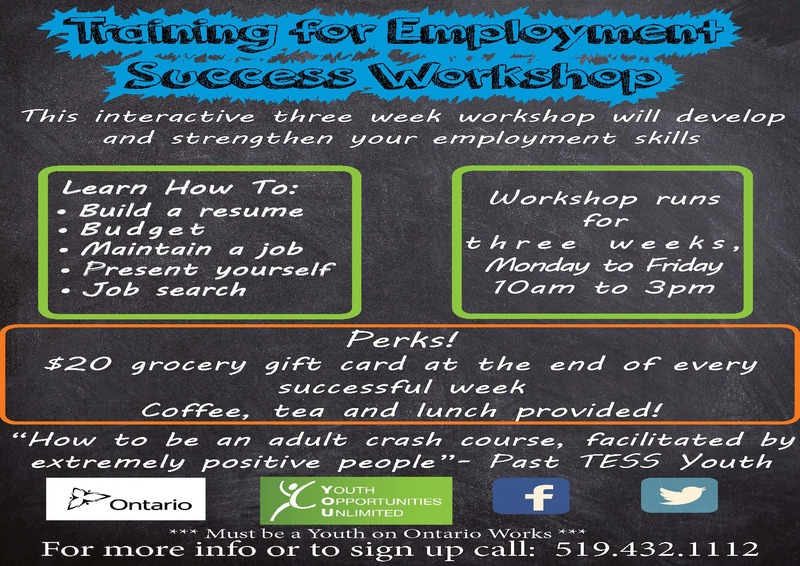 The Training for Employment Success program is a three week, pre-employment program, that support youth on Ontario Works, to build employment readiness skills. Through interactive and discussion based workshops, youth learn the key skills and information they need to navigate the job market! This includes job searching, interview skills and the rights and responsibilities of a worker. Not only does TESS provide youth with tangible employment skills, it also provides youth with transferable life skills, such as time management and communication. Throughout the workshops youth also complete certified trainings in WHMIS and AODA. Youth who take part in the program often comment on how fun and engaging the workshops are, and how quickly the time goes. 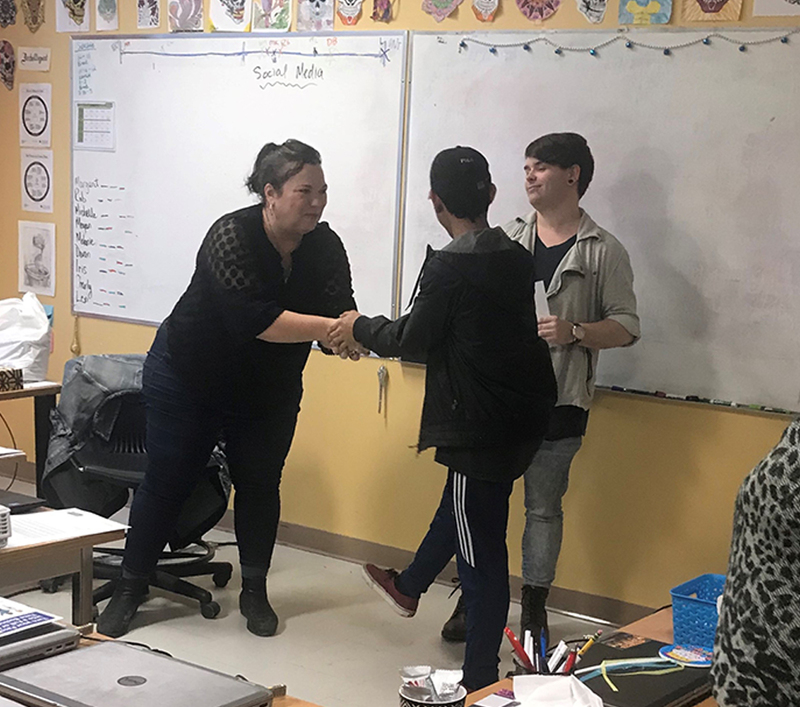 To learn more about Youth Opportunities Unlimited and its programs and services we connected with Michelle Moran, Workshop Facilitator - Training for Employment Success. What is YOU's Philosophy on supporting youth? How do you apply this philosophy to support youth in a meaningful way? YOU believes that investing in youth, and strong communities, go hand in hand. All youth deserve to have safe housing, food security and their basic needs met. From there, with a little guidance and support, they can reach their potential. We believe that “doing” is the best way to learn, so we try to make our workshops engaging and hands on. We also use these methods when youth join our skills training programs at our Café, Recycling Centre or Woodworking Shop. As youth grow their skills and confidence through real life work placements, young people are able to master the skills and get the experience to land them a meaningful permanent job. YOU understands that a “one size fits all” approach is not ideal, so we strive to meet the unique and diverse needs of each young person we meet. Therefore, whomever you are, and whatever you have experienced, we will try our best to help you, or connect you to those that can. Beyond employment skills what are other types of skills that youth learn from taking part in the Training for Employment Success Program or other similar programs? Providing youth the opportunity to further their training in areas such as Safe Food Handling and First Aid/CPR. We always strive to offer youth a positive and welcoming space for them to truly be comfortable and be themselves. We believe it is important to connect youth to supportive mentors and professionals who can help them in determining their needs, reaching out and advocating for a wide range of supports including; connections to both additional internal supports and community based supports. Why is it important for youth to participate in employment, alternative education or skills training programs when a traditional education setting hasn't worked for them? We understand that some people have had and still have challenges in their lives and at school that make them hesitant to join training programs or educational programs. At YOU we do things differently than traditional school and employment programs. First, we work to customize what we offer to each person. If you have unique needs, struggle with anxiety or have life challenges, we can support you through this. YOU is so much more than an employment agency. In our training programs, we offer facilitated conversations and recognize that we are all learners and teachers. We understand that by hosting discussions with youth and learning through activities, we can learn a lot from each other. Having flexible fun programming, allows for young people to still find passion in what they are doing day to day, especially when traditional education isn’t igniting that passion. Being involved at YOU, allows for young people to be involved in a routine that is practical and understanding of the life challenges and barriers they face. 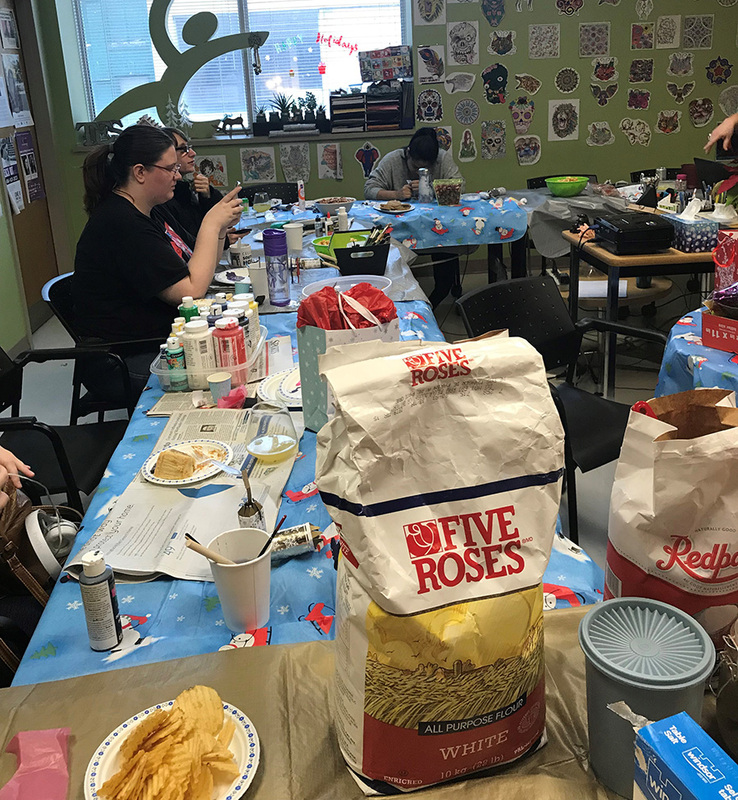 Although Youth Opportunities Unlimited is only located in London, Ontario there are many organizations across the province that support young people to become successful in their community. 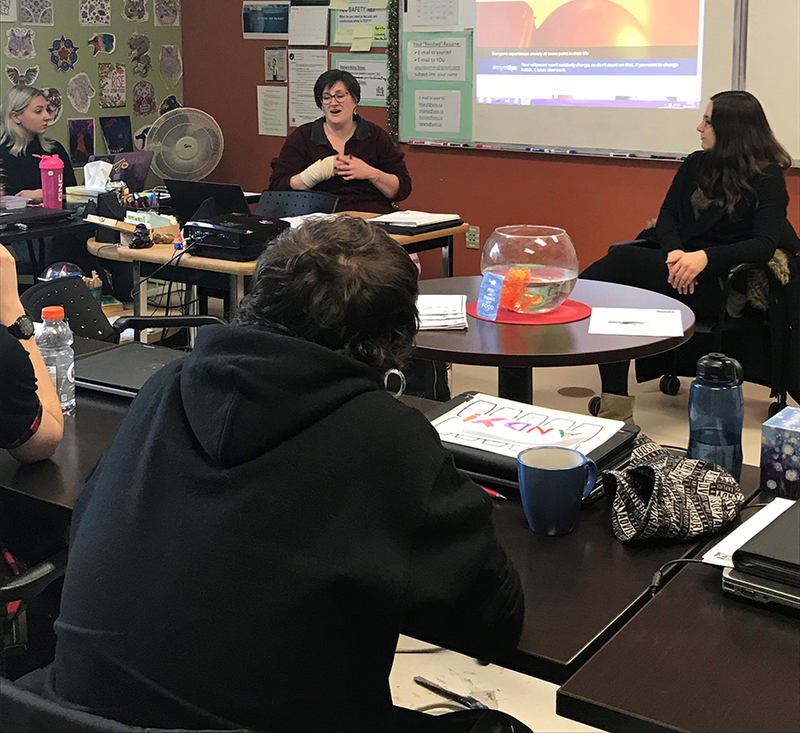 Local, Provincial and Federally funded youth support programs, such as the Youth Job Connection, are available in many communities and provide supports beyond employment. Check out your local employment centres, community centres and youth serving organizations to see what programs and supports they might available in your community.